By Renay Loper (Iwate-ken, 2006-07) for JQ magazine. Renay is a freelance writer and associate program officer at the Japan Foundation Center for Global Partnership. Visit her blog at Atlas in Her Hand. 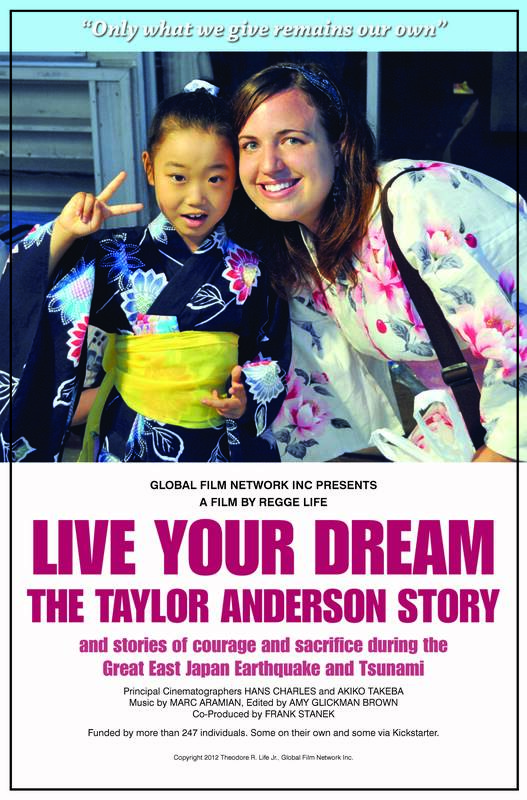 Directed by renowned filmmaker and founder of Global Film Network Regge Life, Live Your Dream: The Taylor Anderson Story is Life’s first documentary about a loss. Best known for his features like Doubles (about Japan and America’s intercultural children), After America…After Japan (about the migration of Americans to Japan and Japanese to America) and Struggle and Success: The African American Experience in Japan, Life opens the window for the viewer to glimpse the life of Taylor Anderson (Miyagi-ken, 2008-11) through personal accounts from her loved ones. Laced with emotional reflections, vivid photos and jovial home movies, the film walks the viewer through Taylor’s 24 years on earth and untimely end caused by the Great East Japan Earthquake and Tsunami of 2011. In light of the tragedy, the film sends a message of hope, optimism and encouragement for all to follow their hearts. The film is divided into chapters, beginning with the first, “She Took Her Time.” Jean Anderson, Taylor’s mother, reveals how in everything Taylor did, she did it at her own pace, including her birth: she was 11 days late. According to her father, Andy Anderson, Taylor grew up inquisitive, interested and easygoing, never letting anyone influence her decisions. Julia Anderson-Kerr and Jeffrey Anderson (Taylor’s sister and brother, respectively) shared what it was like to grow up with such a peaceful and patient sibling. From as early as they could remember, Taylor was into reading, exploring and having fun. Growing up near Richmond, VA, she was first introduced to Japanese at Millwood Elementary School. Her teacher exposed her to the language, artifacts and clothing of Japan at an early age, and from that point on she was hooked. Unfortunately, when she moved on to St. Catherine’s High School, Japanese was not an option, so she continued to study on her own. It wasn’t until her college years at Randolph-Macon College in nearby Ashland that Taylor had the opportunity to visit Japan. She traveled to Tokyo for a January course designed to expose students to the history of the city. Later that summer, Taylor taught at a Japanese language academy, where she was adored by all. It was because of Taylor’s contagious zeal for Japan that her childhood friends and classmates became interested in the country and culture as well. She exposed them to anime, manga and the films of Hayao Miyazaki, inspiring some of them to travel to Japan and explore it for themselves. Upon graduating from college, Taylor knew that she was moving to Japan: the JET Program was the only job she applied for. Her parents reticently supported her, knowing that because of her passion for Japan, she would succeed. Much to Taylor’s chagrin, she wasn’t immediately selected, but instead placed on a wait list. She was extremely disappointed and discouraged only to be surprised a week later, learning that she was accepted. In chapter three, “I’m a JET,” teachers from Ishinomaki in Miyagi as well as fellow JET participants reflect on Taylor’s soft personality; some even likened her mild mannered disposition to that of a Japanese. However, the consensus was that once she opened up, she was a silly and fun ball of joy, often going to karaoke and singing with friends. Chapter seven begins with the morning of March 11 starting as a normal day. It was only the night before that Taylor wrote handwritten cards with personalized notes for all of her students who were graduating that day. When the unthinkable happened, panic and fear consumed the Tohoku region as evidenced through actual footage taken during the disaster. The viewer is exposed to ceilings crashing down and waves infiltrating the town, washing away boats, cars and homes. Children are screaming everywhere and sirens are screaming, and only for a moment can the viewer begin to imagine what it may have been like to be there on that day. After things settled down, all of Taylor’s friends accounted for each other…except her. JET alum Matthew Fuller (Aichi-ken, 1997-99) of the U.S. Department of State knew within 24 hours that Taylor was missing. At first, the U.S. Embassy believed Taylor was alive, only to later learn that they were mistaken. Taylor’s friends went to Mongokuura Elementary School in Ishinomaki, where Taylor was teaching that day, and spoke with the principal, who explained that after ensuring the safety of 80 children who remained at the school, Taylor was last seen heading to her bike to go home. It was only sometime later that the Ishinomaki police department called her friends to say they found someone fitting Taylor’s description. It was also around the same time that Monty Dickson (Iwate-ken, 2009-11), a JET from Rikuzentakata, was discovered as well. As remembered by his friends, Monty was excellent at speaking Japanese and had a great sense of humor. In a reflection from one of his team teachers, Monty wasn’t sure exactly what he wanted to do after JET, but only knew that he was there to serve as a bridge between people. Unfortunately, the devastation was so bad in Monty’s area that even those who knew him couldn’t be reached for comment. After finding her, Mr. Anderson and Taylor’s boyfriend, James Kenney (also a childhood friend) went to Japan to take care of her affairs. While there, they were able to visit a school she taught at to pass out candy to her students. Not only did this act honor her memory, but it helped bring closure to the family. To continue her legacy, The Taylor Anderson Memorial Fund has been established. It has several initiatives, including a JET micro grant, which provides financial support to enhance English language and foreign culture programs initiated by Miyagi/Sendai JET (MAJET) Program participants. This encourages JETs to go beyond the classroom on order to become active participants and leaders in their schools and communities. The one thing that Mr. Anderson would like all who view the film or who knew Taylor to walk away with is: it’s not about what you experience in life, but about how you approach and handle it. This film is a reminder to chase your dream, and live it. Just like Taylor did. Live Your Dream premieres in Los Angeles March 9, Ishinomaki March 10, and Boston March 11-12. 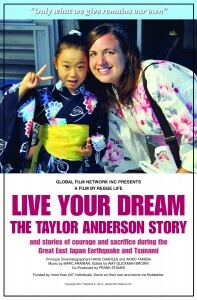 For more information and upcoming screenings, visit www.thetaylorandersonstory.com. For JQ’s 2012 interview with Regge Life on the making of the film, click here.